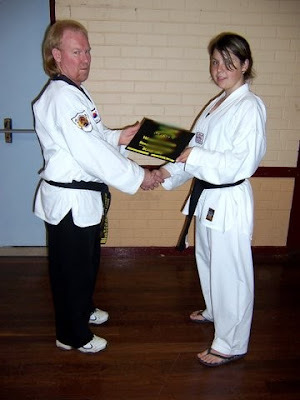 Leanne's Little Place: A Baby Shower, A Birthday and a Black Belt!!!! The place where I come and hide for a while....a little peace and quiet! 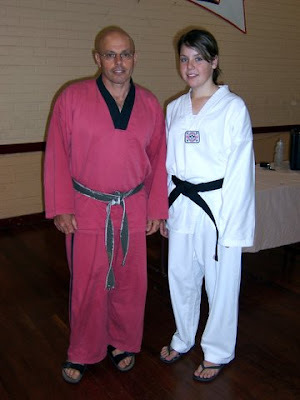 A Baby Shower, A Birthday and a Black Belt!!!! Wow what an awesome weekend our family has had, this will be a big post, sorry, but please persevere to the end!!! 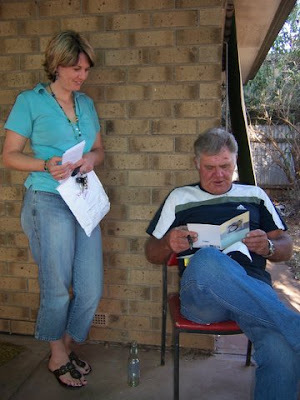 Yesterday was Donna's Baby Shower, was so much fun. Lots of noise, lots of laughter and lots of friends and family. Donna was given some lovely gifts, lots of cute little clothes that will suit either boy or girl, baby blankets, cute little cuddlies, baby rocker and an activity centre and her sister's (Celina and I) gave her something oh so practical LOL a Breast Pump, bottles and bottle brushes and even a video on Breast feeding, so at least the baby won't starve, hopefully!!!! 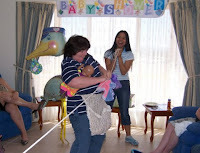 Pin the dummy on the baby, one of the rules was no touching the baby, Donna is such a bugger for the rules, check her out, she had her hands all over the baby LOL. We played this fun game also, I called it Multi-tasking, the object of the game was to hang as many clothes of baby's on the line in 30 seconds, whilst talking on the phone and holding baby, eight items was the most achieved and I think we had about five people on that, so Donna ended having to draw the winner out of a hat!!! 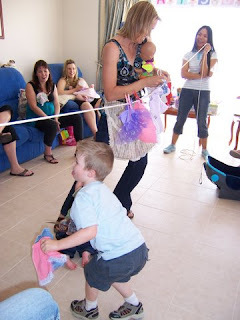 Poor Nicole (Donna's sister in law), really showed us what it was like, with a baby literally hanging off her leg, although you can't really see the baby in this photo and a toddler as well giving her a helping hand. We played the dirty nappy game, what a scream, great for pictures. 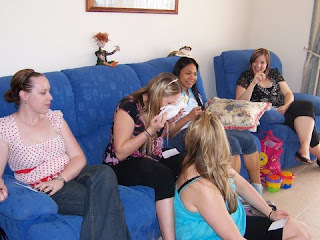 You need six nappies, and six different types of chocolates, melt them into the nappies and then let your guests open and see if they can work out what's in them, the looks on their faces are priceless, check out these pics.....some even get brave enough to eat it!!!! 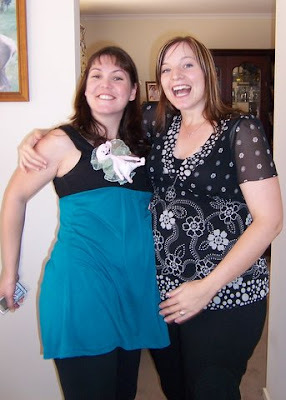 a nice one of two pregnant friends, Kirrily is 6 weeks behind Donna. 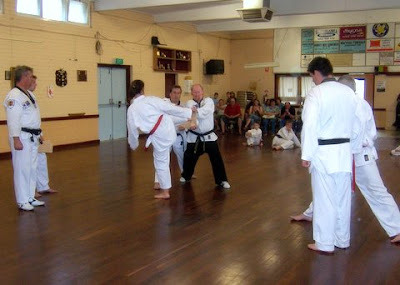 BUT THE BIGGEST NEWS OF ALL.................is the Taeqwondo Grading, both the kids were grading today and both were successful. 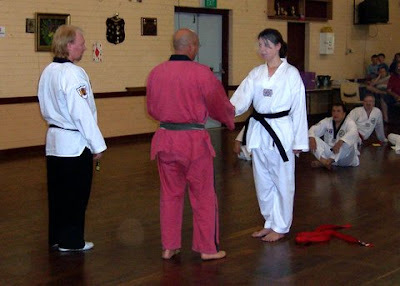 Aaron progressed to Red 3, so now his next belt is black, which should probably take about 12 months or so and Renée has exitedly acheived BLACK BELT. 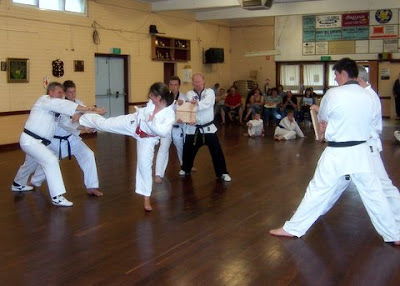 We have had the most stressful week, with stress tears after training Saturday week ago, she was so worried about breaking her boards, she was not confident at all. 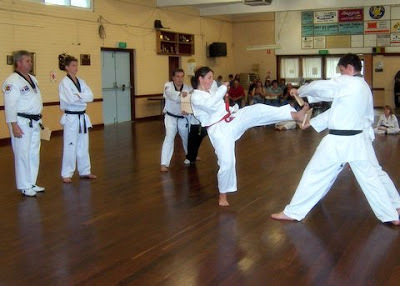 We had to schedule an extra lesson to give her the extra bit of confidence that she needed. 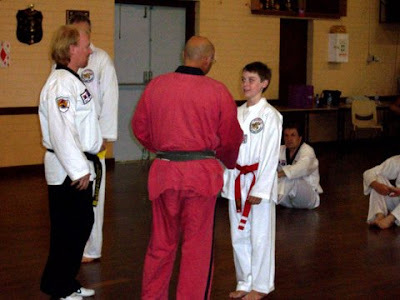 and then the presentation of their belts, firstly Aaron.....poor little bugger he got left in the shadow of her acheivement today, but he did great and we were so proud of his efforts as well, he also was very proud of his sister, he such a good boy, he was happy to make it her day. 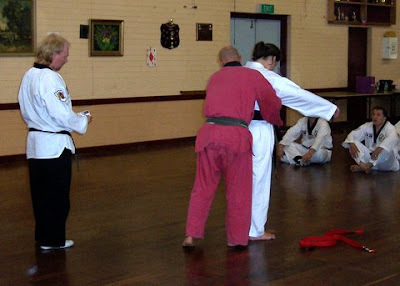 With Mike, who I have affectionately nicknamed Cojack, but not to his face LOL, too scary, he does the grading. 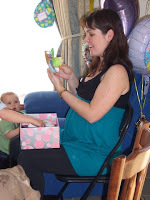 It has been just so lovely watching your sister grow and blossom and wow the baby shower looks like HEAPS of fun!! 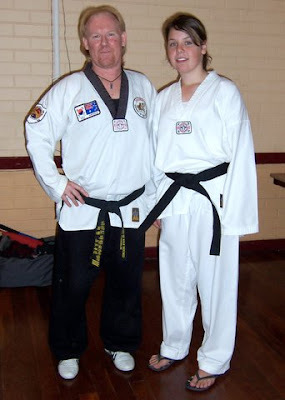 Happy birthday wishes to your dad and BIG congrats to your two kiddies on their belts! What an achievement for sure! 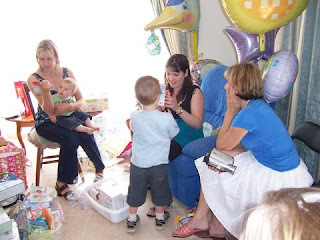 WOW what a Baby Shower. Donna sure is lucky to have such wonderful family and friends. She is still glowing too!! 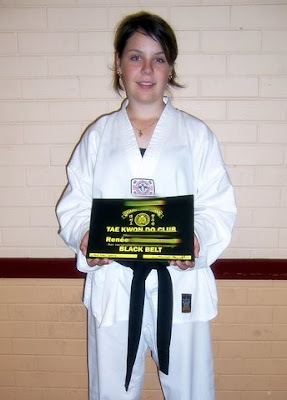 P.S Congrats to the kids on their belts too!! LINKS TO MY GALLERIES - TAKE A PEEK! Get music videos for your own profile! Over 40,000 musieos to choose from at Video Code Zone!